It seems like everyone has their own method of basting quilts together. I've tried lots of different ways and finally settled on this method which works for me and might work for you. 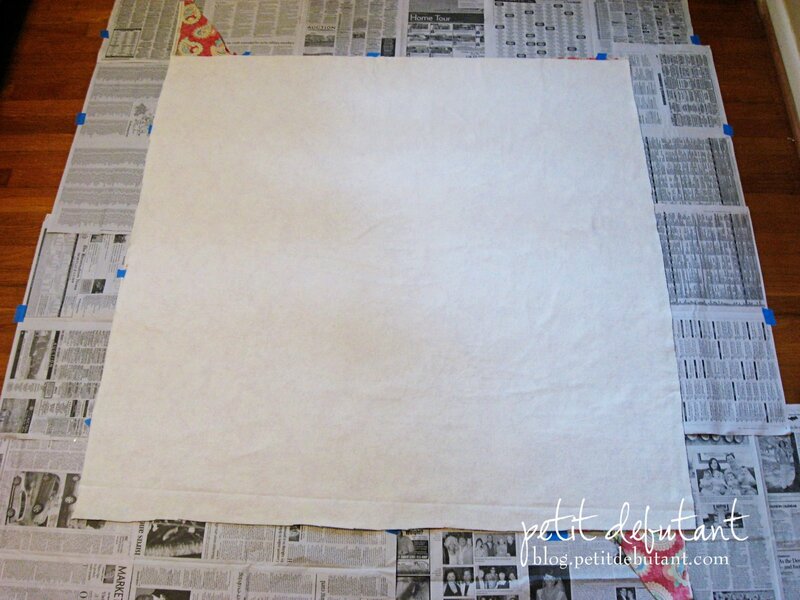 First I lay down my backing on a nice clean floor (this method will not work on carpet.) Then I tape down newspaper all along the outer edges. I use plain old blue painters tape. 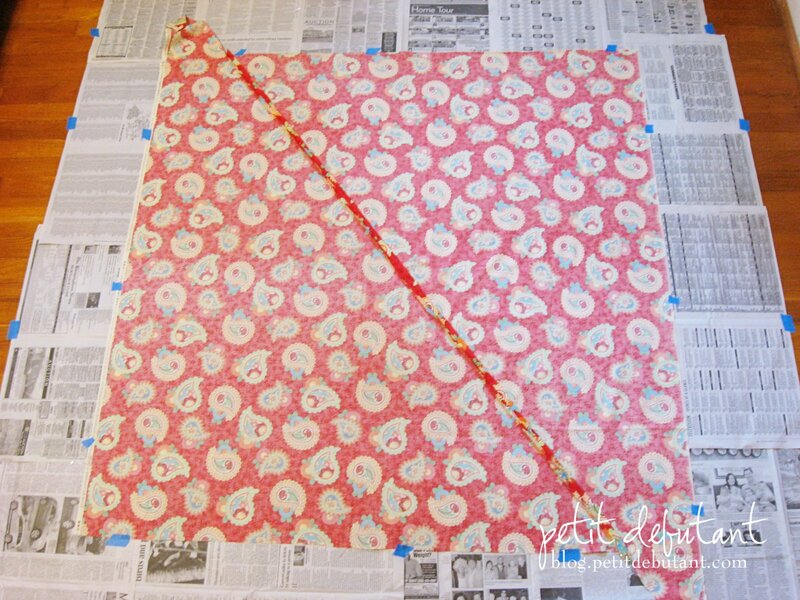 Then I "stretch" out and tape down my backing to the newspaper. I use the word "stretch" for lack of a better word. 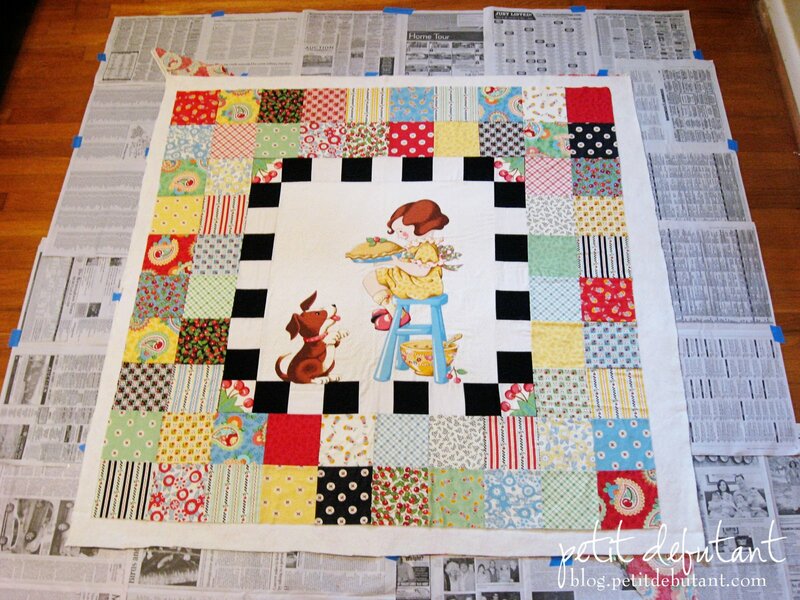 You want the quilt back nice and taught but you don't want to over stretch it or distort it. Notice my diagonal pieced backing! I've been using John Flynn's method for a few years and I love it. It may be a little confusing at first but it is definitely worth learning to do it to save money on backings. Read more here and here. Next I lay down my batting on top of my quilt top in the position I want it. I then roll about 1/2 of the batting back (from either side) and apply spray basting in about 12" rows to the quilt back. Then I slowly unroll the batting over the sprayed area smoothing out as I unroll. I then repeat the process until I reach the edge of the quilt. I then roll up the other 1/2 of the batting until I reach the sticky area that I have already spray basted and repeat the process. 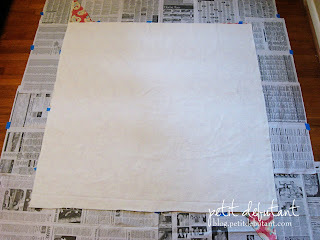 I basically do the same thing for the quilt top. 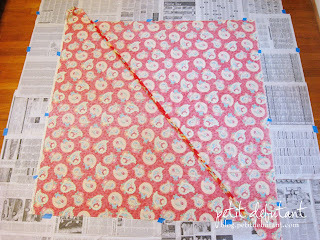 I position it, then roll up half of it and then I spray the batting in 12" rows and slowly unroll the quilt top as I go. Repeat for the other half of the quilt top. I have been using spray basting by June Tailor and have used up one whole can of it and I have one can left. I was able to do several 45x45 quilts with the can as well as several doll quilt sized mini quilts. It is rather expensive at around $9/can but I got mine on clearance long ago for about $4. I don't know if I will buy more of it or try a different brand. I've heard lots of good things about using Aquanet hairspray at around $2/can I'll definitely give that a try! Maybe I can find some coupons to get it for free! I'll have to get a can and try it! I never knew it exisited before and just last night was frustratingly safety pinning a quilt together. that is very interesting. i've never used basting spray. i baste the old fashion way but i just might give your new-fangled approach a try because it sounds very efficient! thanks for the explanation.